Vocal harmony, Fiddle, Hammer Dulcimer, Trumpet, in a string band setting. Blues to airs. Solo project by founding member of Critton Hollow. 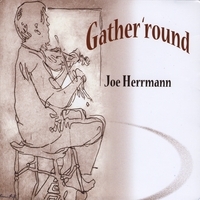 Joe Herrmann is a singer and multi-instrumentalist who has been making music for over 45 years. He is well-known in traditional music circles for his singing and playing. He co-founded The Critton Hollow String Band with his wife, Sam Herrmann, in 1975, and has toured internationally and recorded 8 albums. Joe is known for his patient and generous teaching. "My first instrument was the 5-string banjo ala Pete Seeger and as a child of the '60s we actually had "hootenannies" in our back yard where we would play and sing the popular folk music of that era. In high school it was rock and roll which was a very healthy form at the time and an influence in my musical sensibilities. A bit later it was jazz and by 1974 I had sold all the electric guitars and amplifiers and moved to Paw Paw, WV with my Yamaha acoustic guitar. Discovered fiddle about that time. Rediscovered banjo. Music has been good to me, think I'll just keep it up".